Uniform distribution of data, associated metadata like indexes, and transaction workload make capacity planning and scaling up and down decisions precise and simple for Aerospike clusters. Aerospike needs redistribution of data only on changes to cluster membership. This contrasts with alternate key range based partitioning schemes, which require redistribution of data whenever a range becomes “larger” than the capacity on its node. Minimize time to detect and adapt to cluster membership changes. 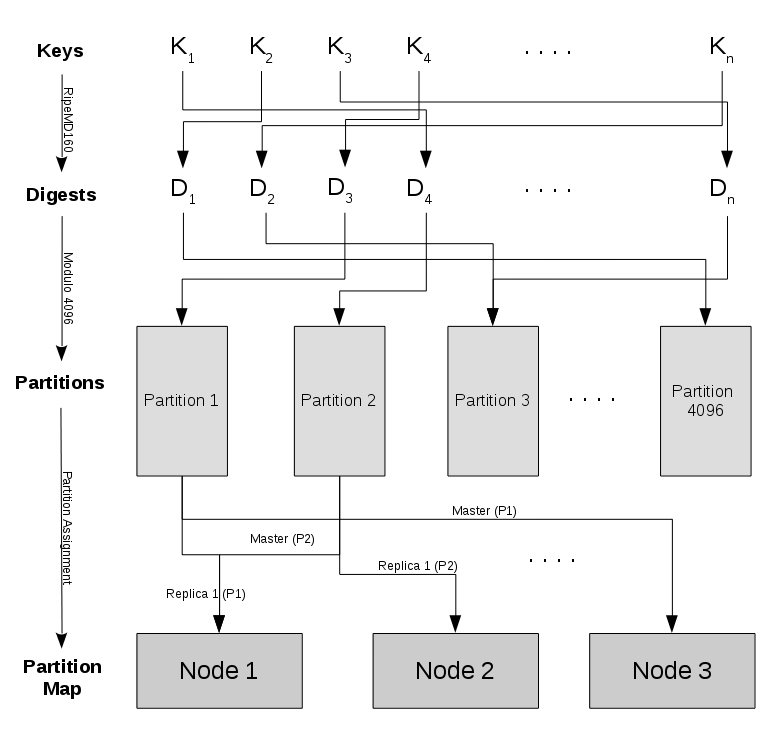 Aerospike distributes data across nodes as shown in Figure 1 below. A record’s primary key is hashed into a 160-byte digest using the RipeMD160 algorithm, which is extremely robust against collisions. The digest space is partitioned into 4096 non-overlapping “partitions”. A partition is the smallest unit of data ownership in Aerospike. Records are assigned partitions based on the primary key digest. Even if the distribution of keys in the key space is skewed, the distribution of keys in the digest space—and therefore in the partition space—is uniform. This data partitioning scheme is unique to Aerospike. It significantly contributes to avoiding the creation of hotspots during data access, which helps achieve high levels of scale and fault tolerance. Live cluster reconfiguration and subsequent data rebalancing is simple, non-disruptive and efficient. To minimize movement of partitions during cluster view changes.